When the boy was in town we visited an area in Cleveland called Downtown Willoughby. On Saturday mornings there is a farmer’s market. The businesses that line the street include independently-owned antique shops, jewelry boutiques, and bars and restaurants. At one of the antique shops I found a copy of Emily Post’s etiquette guide from the 1950s and a vintage Ralph Lauren purse. 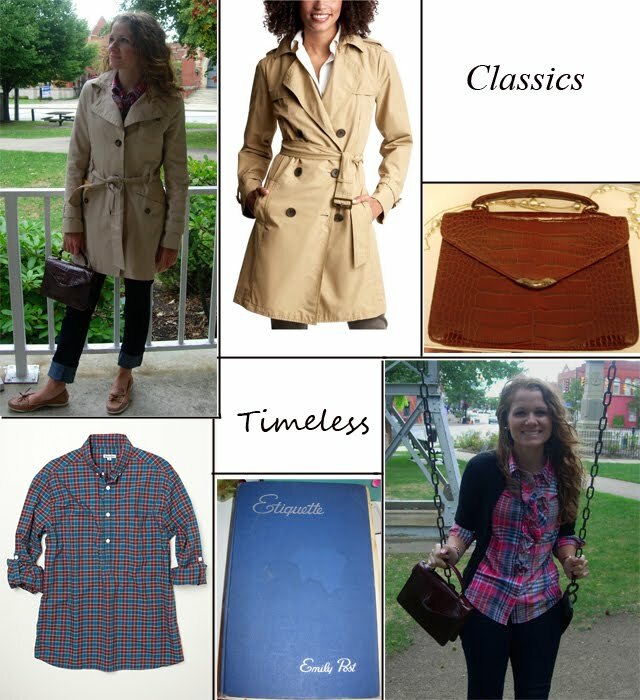 I thought to call this post “Timeless Classics” because Emily Post’s advice is just as timeless as some of the pieces in my outfit. Although some of the rules of etiquette have changed, good etiquette is a timeless virtue and Emily Post is the classic example. If you would be thought glamorous, don’t! It would be hard to think of anything more at variance with charm than a woman who is continually looking at herself in her vanity mirror making moues, and fussing at her hair and dabbing at her face. It is not only bad form, but evidence of ignorance of the meaning of charm. To begin with, the sense of her own value would not allow any woman of charm to risk giving evidence that her natural face is far from satisfactory. After all, it is obvious that one does not mend china unless it is broken, smear ink eradicator on a letter unless there is a blot, or put a patch on something except to hide a hole. A man may not stop to reason whether Gloria Gorgeous would have gray lips, pallid cheeks, and a shiny red nose without her makeup; but to see her continually dabbing and painting and patching cannot fail to impress his subconscious mind with shortcoming that her natural face must have, to need such constant attention. One of these days I'll own a Burberry trench! Le sigh.